Your worst fears came true the night your father never arrived home. Someone killed him during his latest investigation. As you sort through his remaining possessions you discover his diary recording his last moments - and a strange amulet that sends you hurtling back through time to the day before his murder. Time is running out as you race to not only prevent his murder but also to catch the mastermind behind it all. 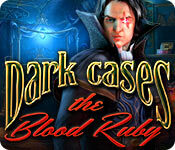 Unravel the trail of clues to locate a deadly ruby before its gruesome powers are unleashed in Dark Cases: The Blood Ruby, a heart-pounding Hidden-Object Puzzle Adventure game.